In the fall, I went on a trip to New York City. So vibrant and alive. I love walking through neighborhoods where the scruffy and tattered rub shoulders with the upscale and elegant. The style of the fonts and lettering on the buildings often tell the story of who is welcome there. One building being restored to glory was having its new numbers installed. That's what this large, multi-layered diptych is about. 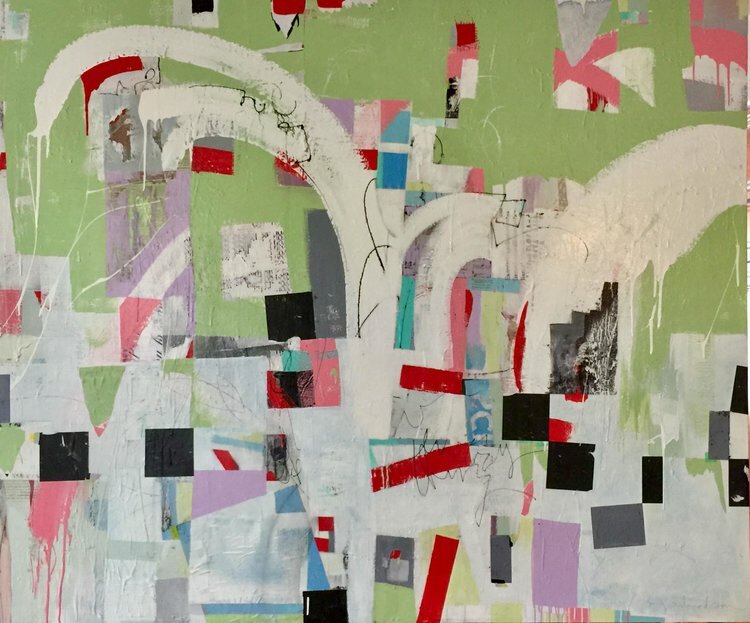 Diptych, 60"x84." Mixed media on deep wood panel. 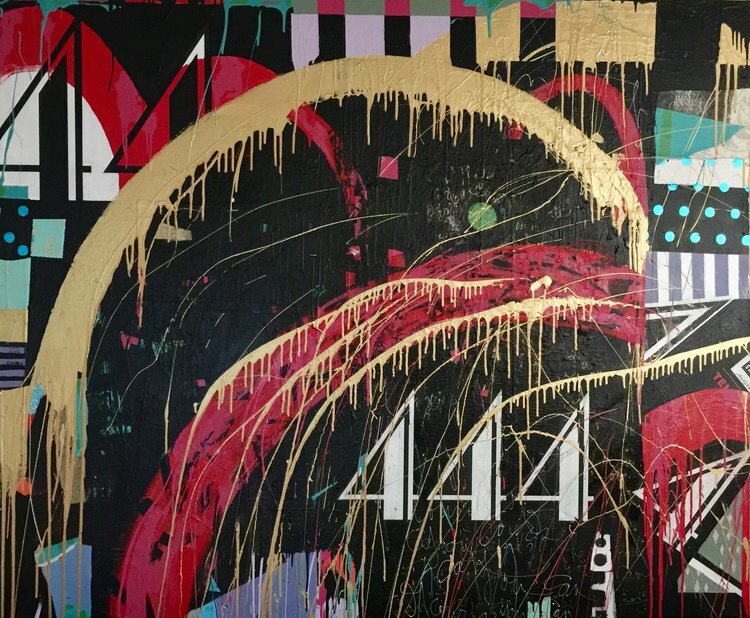 This diptych is meant to feel like two chunks from a wall of graffiti that meditates on the number three. The piece was inspired by the shape of this beautiful graphic image of 3. The juxtaposition of black on white and white on black pull the viewer into the dance of the forms punctuated by brilliant turquoise, pink and red. It's a visual tango danced on a hot night downtown. Diptych, 48"x72" on deep wood panels. This piece, made in early spring, expresses the rebirth of nature and of souls. The many layers of our complicated lives can gather together - and rise. 60" x 72," mixed media on stretched canvas. A rainy, gray day. Looking through the window at the action going by outside the window. Nice to be inside. Nice to let the world go by sometimes. 24"x36" Mixed media on canvas. The noise and action of the city fills your head. Taxi cabs, graffiti and fluorescent lights. And those gorgeous 2s. Twos that could be on the Ritz or Tiffany's. Two is for falling in love. Two for holding hands. Wherever you are, it's good to be 2. 30"x30" Mixed media on deep wooden panel. Things can get messy in the day-to-day scuffle. But some days are golden, and every once in a while, a mighty pawn takes a queen...or a king. 40”x 30” canvas topped with an 8” old wooden “dentil” trim. Following the sale of For Gatsby, I felt the need to create another large piece celebrating the parties, the glitter, the glamour and the ever-illusive green light. 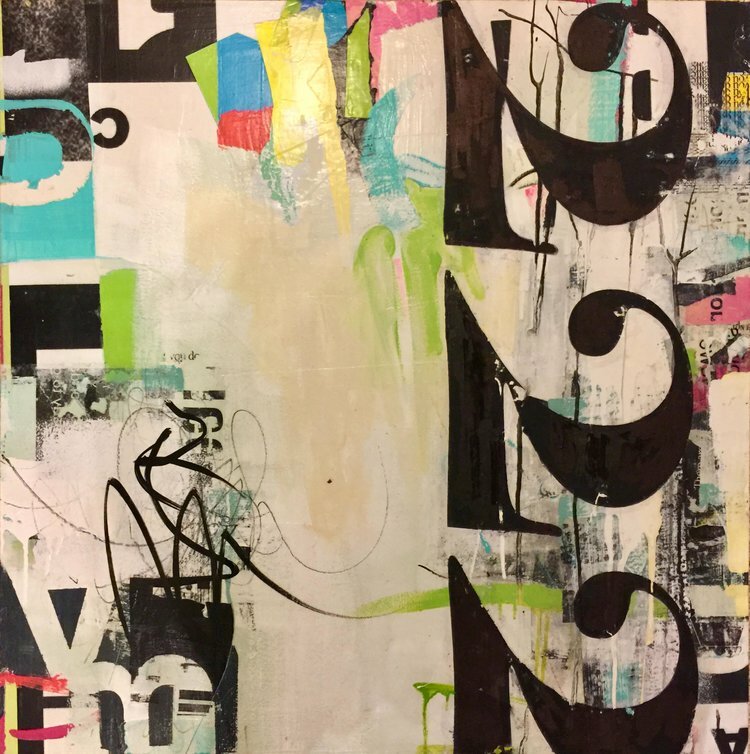 60" x 72" mixed media on canvas. This is called For Gatsby. Why? My favorite book in the world is The Great Gatsby. I first chose the font for the work because it is so evocative and then realized it evoked all things Gatsby. While creating the piece I alternated between listening (again) to the book on Audible and listening to the soundtrack of the incredible Baz Luhrmann film which I hope you hear when you look at this piece. If you look closely, you can see that written across the piece are the words from the haunting and spine tingling Lana Del Rey song, "Will You Still Love Me When I'm No Longer Young and Beautiful." For Gatsby and for all the Daisys too, including me. This piece is big in size and power and fills a room. 60" x 72" mixed media on stretched canvas. The input from the news may be shocking, the paint may be dripping, but the ride is still magical. This piece awarded Best of Show at 2017 Annual Juried Exhibit of the Central Valley Art Association. 30"x30." Mixed media on canvas.